Restifo and Kraft cite clinical reports noting that statin users often are told by physicians that cognitive disturbances experienced while taking statins were likely due to aging or other effects. However, the UA team’s research offers additional evidence that the cause for such declines in cognition is likely due to a negative response to statins. “If we are able to do genetic studies, the goal will be to come up with a predictive test so that a patient with high cholesterol could be tested first to determine whether they have a sensitivity to statins,” Restifo said. The beads indicate a sort of traffic jam, she described. In the presence of statins, neurons undergo a “dramatic change in their morphology,” said Restifo, also a BIO5 Institute member. “Those very, very dramatic and obvious swellings are inside the neurons and act like a traffic pileup that is so bad that it disrupts the function of the neurons,” she said. It was Kraft’s observations that led to team’s novel discovery. Restifo, Kraft and their colleagues had long been investigating mutations in genes, largely for the benefit of advancing discoveries toward the improved treatment of autism and other cognitive disorders. 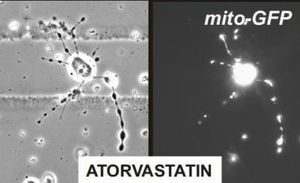 Neurons whose mitochondria are labeled with green fluorescent protein (GFP) reveal that statins cause mitochondria to pile up inside the branches that neurons use to connect with each other. “For some patients, just as much as statins work to save their lives, they can cause impairments,” said Monica Chaung, who has been part of the team and is a UA undergraduate researcher studying molecular and cellular biology and physiology. “In the clinical literature, you can read reports on fuzzy thinking, which stops when a patient stops taking statins. So, that was a very important demonstration of a parallel between the clinical reports and the laboratory phenomena,” Restifo said. “There is no question that these are very important and very useful drugs,” Restifo said. Statins have been shown to lower cholesterol and prevent heart attacks and strokes. But too much remains unknown about how the drugs’ effects may contribute to muscular, cognitive and behavioral changes. “We don’t know the implications of the beads, but we have a number of hypotheses to test,” Restifo said, adding that further studies should reveal exactly what happens when the transportation system within neurons is disrupted. Restifo and her colleagues have multiple grants pending that would enable the team to continue investigating several facets related to the neurotoxicity of statins. Among the major questions is, to what extent does genetics contribute to a person’s sensitivity to statins? “We have no idea who is at risk. That makes us think that we can use this genetic laboratory assay to infer which of the genes make people susceptible,” Restifo said. The team’s findings and future research could have important implications for the medical field and for patients with regard to treatment, communication and improved personalized medicine. “These are not trivial things. This could have a significant impact on your daily life, your interpersonal relationships, your ability to hold a job,” Restifo said. “There is good clinical data that every-other-day dosing give you most of the benefits, and maybe even prevents some of the accumulation of things that result in side effects,” Restifo said, suggesting that physicians should try and get a better longitudinal picture on how people react while on statins. Comment: For more information on the devastation caused by lowering cholesterol drugs see Statin Nation by Justin Smith. This entry was posted in Health and tagged cholesterol and heart disease, Farmington Hills chiropractor, side effects, statins by tiptonchiro. Bookmark the permalink.